Ferdinand Le Drogo (10 October 1903 – 24 April 1976) was a French professional road bicycle racer. He is most known for his silver medal in the Elite race of the 1931 Road World Championships. Ferdinand Le Drogo was the older brother of cyclist Paul Le Drogo. 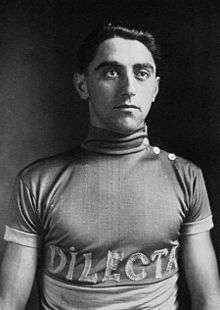 In the 1927 Tour de France, Le Drogo took part in the Dilecta-Wolber team, which won the first stage, led by Francis Pélissier, who was the first leader of the general classification. Le Drogo won the fifth stage. In the sixth stage, Francis Pélissier abandoned sick. Ferdinand Le Drogo, who was second in the general classification, became the new leader. In the seventh stage, while Le Drogo was in the yellow jersey, the Tour passed in the region where he was born. His supporters cheered for Le Drogo, and he got excited and sped away from his team mates. That cost him too much energy, and he lost 20 minutes in that stage to the J.B. Louvet team, so the lead was transferred to Hector Martin, from the J.B. Louvet team. Le Drogo would never lead the Tour de France again. ↑ Tom James (15 August 2003). "1927: Alcyon deliver victory". VeloArchive. Retrieved 24 September 2009. 1 2 McGann, Bill; Mcgann, Carol (2006). The Story of the Tour De France Volume 1:1903-1964. Dog Ear Publishing. pp. 84–84. ISBN 1-59858-180-5. Retrieved 24 September 2009. ↑ "1927: Nicolas Frantz legt in de cols de basis voor zijn Tourzege" (in Dutch). Tourdefrance.nl. 19 March 2003. Retrieved 24 September 2009.